Due to removal of undergound belt compression trick I would like to offer you a combinator based alternative. 1. Each belt tile has 32 slots. 2. Each item takes 9 slots on a belt. 3. Yellow belt advances 1 slot forward every game cycle (2 for red, 3 for blue). The trick to compress a belt is to put items on every 9'th slot of the belt. This way you will have gaps that are divisble by 9, therefore they can always be filled with items. 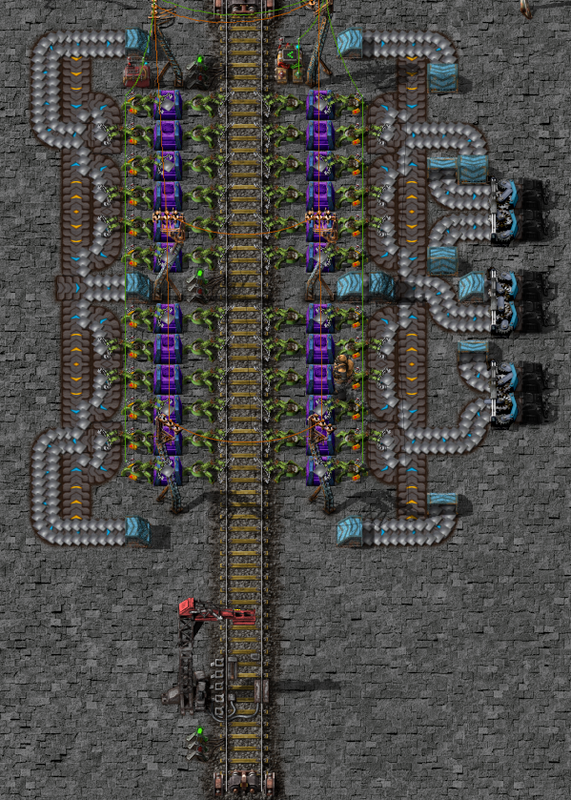 To achieve this all your inserters should be enabled once every 9 cycles and offset according to their position along the belt. You will need a combinator setup that cycles a signal from 0 to 8 every frame and inserter conditions set to 'signal = 32*x mod 9' (where x is belt tile number). The pattern repeats itself every 9 tiles. With this particular setup you will get very rare gaps because one side of the belt uses long inserters to grab the ore so it gets a little advantage over the other. This should not be the problem if your setup is symmetrical. This will be a little different for red belt. Because it moves 2 slots a frame the pattern will repeat itself every 18 tiles instead of 9 and inserters can only be placed on tiles with offset divisible by 2. For blue belt pattern goes back to 9 tiles, but you can only place inserters on tiles with offset divisible by 3. Last edited by sicklag on Wed Jan 10, 2018 8:06 pm, edited 1 time in total. sicklag wrote: It would be nice to see a picture of the blueprint/build. 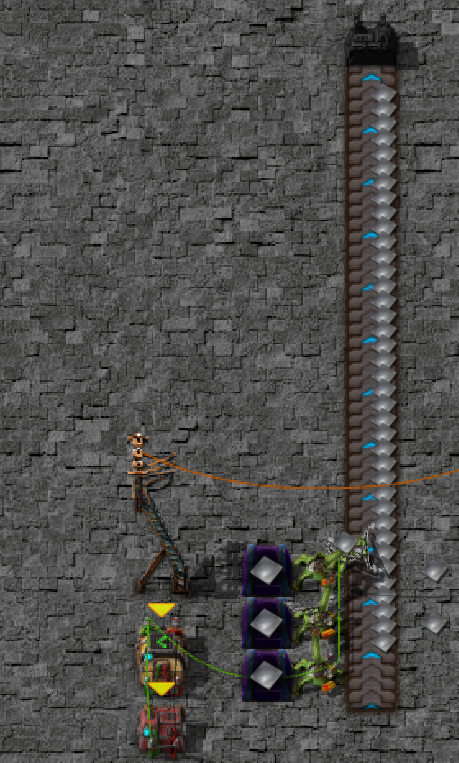 The belt compression in 0.16 is really bad, but I never would use your "trick". Idk but that's a lil bit too much just to compress a belt(for me). The old version of belt compression was much better and as for me( a semi-noob I come in big struggle with the new system--->fun down). the devs are aware of the belt compression issue, and will be addressing it. try to be patient with them. they have a lot on their plate with this release. Or simply use the easy road and use @Klonan mod belt buffer, with luck it will make it's way to vanilla. That is what I call creative! vtx wrote: Or simply use the easy road and use @Klonan mod belt buffer, with luck it will make it's way to vanilla. It doesn't help that 0.16 suffers from similar splitter bugs to 0.15, but, worse, when it comes to merging two lanes down to one (just try experimenting with fully compressed, fully consumed belts and the more interesting wiki balancers and you'll see what I mean). However, I learned my lesson in 0.15: I'm going to defer any bug-report about this until all major changes to belt dynamics are implemented and several revisions have passed on top of that (maybe fortune smiles on us and those issues get ironed out in the process anyhow). I think side loading should compress. Because it makes transport worse over distance, much like loosing compression in corners. I love the fact that timing lets me remove all splitters/mergers/undergrounds and what have you. Thanks, Grooohm! That helps a lot. Here is a 16.27 16.25 version with another trick to compress stuff. - Only tried with full stack bonus reseach. [EDIT:] Added remarks from Impetus. TY! Last edited by disentius on Fri Feb 23, 2018 7:52 am, edited 1 time in total. disentius, that is clever and works well when the stack inserters have a bonus ≥ 6, and the belts have no backup. the red wires are just connected to the chests/poles, correct? i assume for count tracking. or left over. also noticed your code tag is a little off. Thanks Imp. Added your remarks to post.